Advantages: Wealth of information presented, superb decal sheet, informative set of general arrangement drawings and details. Disadvantages: Choice of photographs and their reproduction. Number four in Kagero’s “Legends of Aviation” series focuses on the SE5/5a. With a total of eighty-four pages, the book is presented in the familiar A4 soft cover format. There are eighty black and white photographs and the layout sees these printed to a commendable size. Despite this, the images are not as clear as one would expect and many have been reproduced to a better standard elsewhere. The selection of some of these can also be considered strange. An image showing pilots of 68 squadron during their DH5 days is certainly out of place. The inclusion of the infamous “aerial dogfight” series must also be questioned. The captioning of these fakes merely stating “a fierce dogfight against Albatros D.V.’s” amongst other one liners. The book is very comprehensive though and shows the author has gone to a lot of trouble to make it as complete as possible. It all starts with a combat taken from “Sagittarius Rising” by Cecil Lewis. 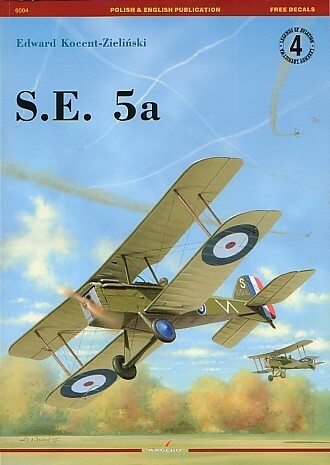 From there the author discusses the origins of the British Air Force before talking about the evolution of the SE5. The reader is lead through the various issues relating to the engines, prototypes, manufacturing and production runs. The latter is covered with an explanation of the changes made as well as a breakdown of the licensing to each company involved. A list is also supplied matching serial number blocks to manufacturers. There is a chapter on the general description of the aircraft before a dive into the combat use by the different squadrons. This gives a brief description of the unit, and some of the more common Aces that flew the type. Other than the British squadrons, users from additional countries are also mentioned. A section on painting and markings leads into sixteen pages of General Arrangement and detail views. The majority of these are in 1/48th scale with the occasional close-up being in the larger 1/24th. These are very detailed and cover the SE5, SE5a and the numerous variations thereof. A bonus is seeing the full underside of the top wing, a feature most publications leave out. The majority of the interior drawings are in colour and help the reader ascertain exactly where the internal components are located. It’s a pity that none of the items are labelled though. The author’s enthusiasm for the aircraft is evident in the writing, and occasionally leads to the inevitable piece of bias. For example, he uses the shooting down of Werner Voss as an example of the SE5a’s qualities. What he fails to mention is that in the dogfight the odds were 6:1 against him and in the words of one of those present, “(Voss) could have disengaged himself from the combat at any time”. There is the odd “hiccup” contained in the text, the most obvious being on page 9: “In 1916 the then best fighter aircraft with the RFC – the Sopwith Camel – proved worse than Fokkers and Albatroses in terms of performance and armament”. Hmmmm. The translation from Polish to English is very good with little interruption in the flow of the sentences. Fifteen colour profiles are displayed with five of them appearing on a decal sheet. 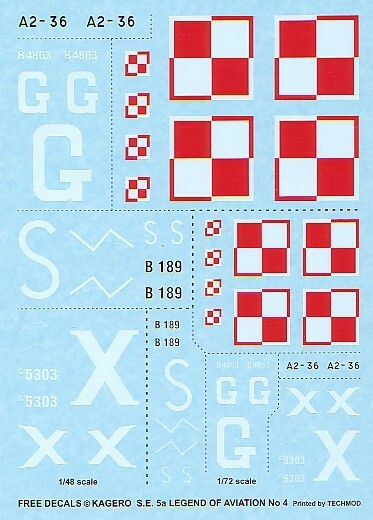 This sheet is beautifully printed and has markings for both 1/48 and 1/72 scales. All items were in perfect register on the very thin carrier film. SE5a rebuilt in Australia as a two seater, Point Cook 1930. SE5a, c/5303 of 56 Squadron. SE5a, B4863, of 56 Squadron, flown by Captain J T B McCudden. SE5a, B 189, of 40 Squadron, flown by Captain J Tudhope. A couple of comments are necessary concerning schemes 4 and 5. If you plan on doing McCudden’s aircraft, there are published photos that show no white outer ring on the top wing roundels. Regarding Tudhope’s machine, the eagle-eyed viewer will notice the different interpretation of the lower ring roundel position on the profile compared to the cover painting. The profile also portrays asymmetrical upper wing roundel positions. A clear photo of B 189 indicates the roundels are much further outboard than the profile indicates. Photographs of 40 squadron SE5a aircraft taken after late March 1918 reveal the new “N” flash unit marking that was applied to the fuselage sides. 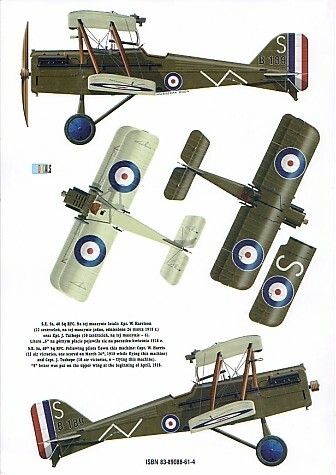 Quality prints of the aircraft in scheme 5 clearly show the three over painted white bands that were the old unit markings. Also covered up but still discernable was the fuselage “S”. The upper wing “S” should be on the port side, not on the starboard as depicted. Also missing is the white chevron on the tailplane, a marking seen on some other 40-squadron SE5a aircraft. This is a very interesting book and one that has a lot of information to absorb. There is a mass of plans for the enthusiast to digest and these will keep the devotee busy for quite a while. Meanwhile the modeller can enjoy the first class decals and use these to create another masterpiece from the latest SE 5a offerings.